Samsung emerged in the late 20th century as one of the highest rated and most popular consumer electronics companies in the entire world. Even if you try to narrow a product line down to what’s most accessible and available to customers (like TVs, the focus of this article), you’ll find yourself left with dozens of available options, each with specific strengths and particular weaknesses. Because those who are looking at upgrading to a high-end TV more than likely already have the in-depth knowledge to begin to wade into the TV comparison waters, this review will focus on the best entry point into the Samsung ecosystem by drilling down to their 40-inch 4K TVs. What’s the Difference Between HD, Full HD, UHD, and 4K TVs? When it comes to HD or Full HD versus 4K, though, the difference comes down to pixels. An HD television offers a resolution of 1,920 vertical columns and 1,080 horizontal rows of pixels. (The number of horizontal rows is why HD is often referred to as 1080P.) Doing the math, an HD TV has over 2 million total pixels. A 4K TV has over four times as many pixels, allowing for greater image detail. Regarding resolution, these TVs are 3,840 pixels wide by 2,160 pixels tall. Just like with regular HD TVs, the number of pixels high can also be used as a shorthand for its resolution. So, in this case, 4K is said to have 2160P resolution. Confusingly, though, the name “4K” comes from how many pixels wide these TVs are. UHD TVs are 4K TVs, and both have a resolution of 2160P. Will the Image Quality of a 4K TV Make That Big of a Difference if You Already Have an HDTV? Yes. 4K TVs have to be seen to be believed, but once you see one, you’ll most likely be a convert. They have almost four times as many pixels as an HD TV (8,294,400 vs. 2,073,600). Put another way; it would take four HDTVs to match the number of pixels offered by a 4K television. This means you’ll see far greater detail in a 4K TV and the image won’t break down as you get closer – one of the reasons you see new 4K TV owners standing and marveling so close to their new screen. There’s no doubt there are a lot of really good TVs out there from a wide assortment of brands and manufacturers. Sony, Phillips, and Panasonic are just a few of the most popular brands, and it would be easy to start a list and populate it with any number of televisions from those companies, as well as some other upstarts and high-quality knock-offs. Sometimes it just comes down to brand loyalty, however. If you already have a Samsung tablet, phone, or smart fridge, to maintain similar interfaces and maximize the potential for smart home connectivity, you may not want to stray too far from your current ecosystem. Setting aside larger displays helps make this review perfect for those who are only now looking to gain a foothold into the 4K market. As screen sizes grow, so does their price. Meaning, the more space on your wall your TV takes up, the more of your paycheck it takes up, too. There are dozens of other lists that include bigger models, but by focusing on the smaller sizes, we’re also able to focus on feature sets and other accouterments that may make one model line edge out others. What is the Price Range When It Comes to a Samsung 40-Inch 4K TV? Samsung kept the price range consistent among their 40-inch TVs. Each costs a pixel short of $400. However, this price is based on Samsung’s website, so you may be able to find cheaper deals elsewhere (especially during sales-intensive periods like Black Friday or post-Super Bowl). Purchasing a refurbished TV can also knock down the price considerably. When doing so, always make sure to the check the included warranty, if any, and try to purchase a product that’s been refurbished by the manufacturer itself rather than a third party. Reviewing TVs isn’t all fun and games like it may seem, because it takes real dedication to the craftwork of each model. To create a list that is as all-encompassing as it is bias-free, we looked at information from credible sources, like consumer electronics review websites, as well as online customer reviews. Using this process allowed us to be informed by both experts who do this for a living and the people who actually own these televisions. By combining high-level knowledge of the specs with information from these two sources, we’re able to compile the best possible list for the consumer (I.e., you). This top line Samsung 40-inch 4K TV features skinny bezels and a slim design that hold a luxurious ultra-high definition display capable of upscaling non-4K content so that no matter what you watch, you’ll be amazed by the image clarity. It can do that through its UHD Engine that creates colors with brighter brights and darker blacks than comparable models. While the UHD standard calls for at least 1,024 shades per each primary color (again, blue, green, red), the NU7100 line incorporates millions – that's right, millions – of shades for each color. This PurColor system automatically adjusts with each image, adding vibrancy and realism to even the dullest videos. Combined with its HDR-capable screen and a motion rate of 120 frames per second (FPS), don’t be surprised if, a quick spin around the TV dial to see what it is capable of results in a marathon binge of brilliantly smooth and detailed television shows and movies. A smart TV that doesn’t make you feel dumb when operating it, the NU7100 is feature-rich with a seamless, intuitive universal guide that can search live TV, recordings, and streaming apps like Amazon Prime Video, HBO Now, Hulu, Google Play, Netflix, and YouTube. You can control the guide from your phone via Samsung’s SmartThings app. With a compatible phone, you’ll also be able to access stored contently remotely, meaning this Smart TV acts as an entertainment hub for your home or apartment. For gamers, another neat feature is the ability to stream video games through the Steam Link app. So, if you’re struggling to master your latest download on a paltry laptop screen, you’ll be able to view and play your favorite game through your new 4K TV instead. However, this model is far from perfect. The most common complaints are regarding the viewing angle. Multiple online reviewers state that while the picture is impressive when watching from directly in front of the screen, those who were forced to watch TV at even a 20- or 30-degree angle saw duller colors and washed-out whites. Distinguishing between Samsung’s top line and mid-tier 40-inch TVs is a bit like splitting hairs. Both are the same price, although the NU7100 is currently discounted down to its $ price point and both offer 4K viewing experiences with motion rates of 120 FPS. If you’re looking for the lightest TV, the mid-tier MU6300 is two pounds lighter than its top-tier brother. However, it’s slightly bigger overall (emphasis on the “slightly”), standing .1 inches wider, .2 inches taller, and .2 inches thicker than the NU7100. Coming in at that extra .004 cubic inches seems worth it to shed a couple of pounds and perhaps have an incrementally easier time mounting the set. The MU6300 upscaled non-4K images but does it in a less powerful display engine, so some images retain their dulled colors. Still, 4K viewing will look just as good on this TV as the NU7100. An added feature here that the top tier model does not include is the Samsung OneRemote. The remote automatically senses all devices that require control, including soundbars, DVD or BluRay players, as well as the television set itself. This requires no manual intervention, thankfully, and also provide voice support for searching and controlling content. Instead of fumbling to find which button pauses the streaming video, you’ll be able to use your own voice to stop playback. In online reviews, this model seemed to suffer from the same viewing angle issues as the NU7100. So, it may not be the perfect centerpiece TV for regular watching or viewing parties. It’s hard to recommend this bottom tier model, especially since it’s priced the same as the other two 40-inch TVs Samsung offers. This line doesn’t even provide 4K resolution, topping out at merely full HD, or 1080P, resolution. It’s also heavier and thicker than the other two models, making its target audience those who prefer dull colors and minor inconveniences. Not to brush it aside, the M5300 does offer adaptive lighting, which employs a sensor (dubbed the “Eco Sensor”) to adjust the display’s brightness depending on the lighting environment of the room where the TV sits. This a nice feature, but not one that makes it more appealing compared to its equally priced, but more powerful, siblings. 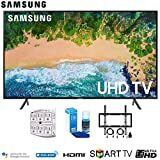 36" x 20.9" x 2.3"
If you’re looking for the best Samsung 40-inch 4K TV, you’re looking at their NU7100 or NU6300 model lines. Both provide amazing video quality for UHD content and are currently priced at $. The NU7100 does slightly better when it comes to upscaling but does suffer from the same viewing angle issues as the NU6300. Either one is a great choice, with the NU7100 narrowly edging out its mid-tier sibling due to its more expansive feature set.